Features Optimize your HP Business Notebook performance and realize energy savings with the new low-power HP 4 GB DDR3L 1600 MHz 1.35V SODIMM memory. - Enable fast start-up times with few delays during routine operations and support simultaneous opening of and toggling between large files (presentations, spreadsheets, and graphics, etc). - Enjoy power savings compared to predecessor memory with just 1.35 V output. 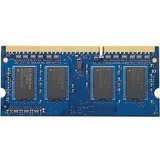 - HP rigorously tests and qualifies all suppliers for ensured quality so that memory works seamlessly with HP products. Buying HP-branded memory helps ensure all memory characteristics match when upgrading.